Discussion in 'SWNN News Feed' started by SWNN Probe, Aug 29, 2018. Because Rian Johnson has been the target of controversy from fans who weren't thrilled with The Last Jedi since the release of the film, and there aren't constant announcements about his series of Star Wars spin-offs since development on them has only just begun, every now and again speculation posing as a rumor comes along saying that they're going to be cancelled. Rian Johnson has indirectly debunked those concerns via Twitter today when a fan asked if his movies are still being worked on, to which he said yes. Amusingly enough, this morning tweet came hours before another 'rumor' about Lucasfilm getting cold feet about Johnson surfaced. But the thing is that Johnson has been in a pretty safe position at Lucasfilm for quite a while; Disney CEO Bob Iger was a fan of The Last Jedi, he greenlit his planned trilogy of movies, and the studio saw no need to heavily overhaul his movie during the long period of post-production that the film had. Aside from the aforementioned anger of a particular group of fans who ultimately make up a small portion of the Star Wars franchise's global audience, there's not a whole lot to actually substantiate the idea that Johnson on his way out. Immediately after Solo's poor financial performance, Lucasfilm have told ABC that Rian Johnson's movies are a priority for the studio, along with the movies being developed by David Benioff and D. B. Weiss (the showrunners behind Game of Thrones). There are other projects being developed as well that have yet to be announced; even though both were discussed, movies about Boba Fett and Obi-Wan Kenobi have not been confirmed to be in-development by Lucasfilm. The 'one-off' Star Wars spin-offs aren't being cancelled, they're just being rethought as two major Star Wars movie series - one from Johnson and one from Benioff and Weiss - will take center stage. The thing is that, when working on a major project, much less a planned trilogy, development takes quite a bit of time. So it's not surprising that there's an absence of casting news on this project. But the absence of news does not equate to nothing happening behind the scenes. It'll be years from the release anyway, at which point current 'hot take'-based anger will likely have subsided. Regardless of how TLJ the force can't let RJ go that easy. With all the controversy, anything other than official announcements would just be clickbait at this point. Let's focus on Ep.IX, Resistance and JF show. Of course he's still working on new SW movies. 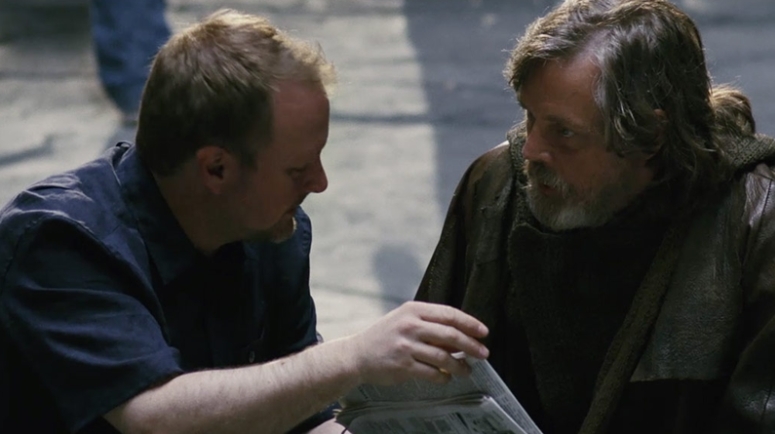 TLJ made alot of money, Rian was good to work with and he finished everything in time and budget. If (again "if") LF and Disney will ever decide otherwise they won't do it now. And above all they'll do it... gracefully. Meaning it won't look like TLJ backlash was the problem. "unfortunately due to creative differences we mutually decided to part our ways". Solo was reprisal to TLJ and that small portion of fans is much larger than you think. RJ should make his own movies and not further ruin SW. Solo actually pretty good. I think it will be heavily Jedi/Force focused. That was one of my favorite things about TLJ. It was the heaviest of the non prequel films in Force lore. and yet without being heavy, which is what i love about the way he handled it. the mysticism was intact and it wasn't about how many magical acorns you have to eat or whether you trained with gnomes or how old you were or how many masters and apprentices you're allowed, etc. etc. etc. it opened the Force up again and freed it from the matted dreds of midichlorians and whatnot. Solo was a flop because of it's overinflated budget and a lack of a proper marketing campaign. Even a sub-$400M gross, disappointing as that would be, would have been fine for the movie if it had been made for $125M-$150M like originally planned. General audiences were apathetic and that's where a bulk of the "first/only viewing" money comes from. (Overseas audiences not chipping in is where the biggest issues with the film lie, to be frank.) Fans help with repeat viewings, but most of the time you're doomed if you just go for fans. Original budget for Solo was for a moderate blockbuster. The inflated budget was to save it, not because they expected a bigger box office. Although the movie turned out good, the production problems still screwed everything up. Think about this in 2017 LucasFilm had Star Wars Celebration and Disney had D23. What exposure did Solo get? Nothing. The issues with directors wasnt public yet when Celebration was going on, but LucasFilm certainly was already dealing with it. D23 showed nothing at all about Solo. So until Super Bowl in February the only marketing was Ron Howard social media posts and a poster that literally was only the logo. Disney really screwed up by not pushing to December. Instead they had a couple of months while Black Panther, Infinity War and Deadpool were all being heavily marketed including marketing before the 1st teaser for Solo. Solo according to the "boycotters"
It failed because we boycotted! Also, it was the kind of Star Wars we wanted! No doubt they should have delayed it but I can't help but think they were really testing their floor for a Star Wars film. Now they know. If you can make a movie for 100m or under and generate 400ish world wide, you're okay. And it hopefully won't have director troubles to this extent. Or no marketing. Or be sandwiched between other mega blockbusters. I will watch anything star wars but I will reserve RJ movies for DVD or Netflix even. Not going to go wait in line for bland story telling. Fun fact: we have very different definitions of bland. Maybe give his other films a chance. You might be surprised. He new movie coming out this year seems pretty cool and far from being "bland"